Is your sun protection brand protecting your skin from the broad spectrum of rays from the sun? Most sun protection brands only protect you from UVA and UVB rays but fail to protect you from the Infrared-A rays that can penetrate the skin deeper causing cellular-level damage which leads to short and long term skin damage. The effects from this damage can include premature skin ageing, decreased skin elasticity, increased wrinkling and importantly, damage to the skin's DNA that can also impact your long-term health. Skin cancer is the fastest growing of the top ten cancers in the UK, so protecting your skin from the harmful rays of the sun is something that is really important and easy, to introduce to your skincare routine. Ladival Sun Protection is the latest revolution in sun care and the first mainstream brand to protect your skin against harmful Infrared-A rays as well as the UVA and UVB sun rays. Choosing a sunscreen that includes Infrared-A protection, you are protecting your your skin four times more from the sun's damaging rays. 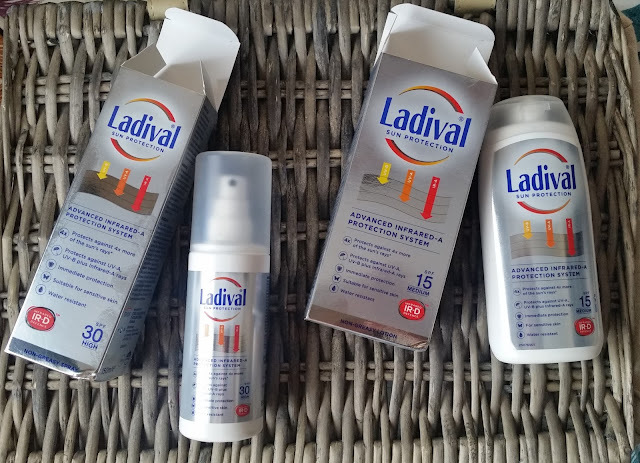 Ladival has a wide range to suit everyone, Lotions to sprays that have SPF'S from 15, 30 to 50 as well as a kids range so you can protect the whole family. 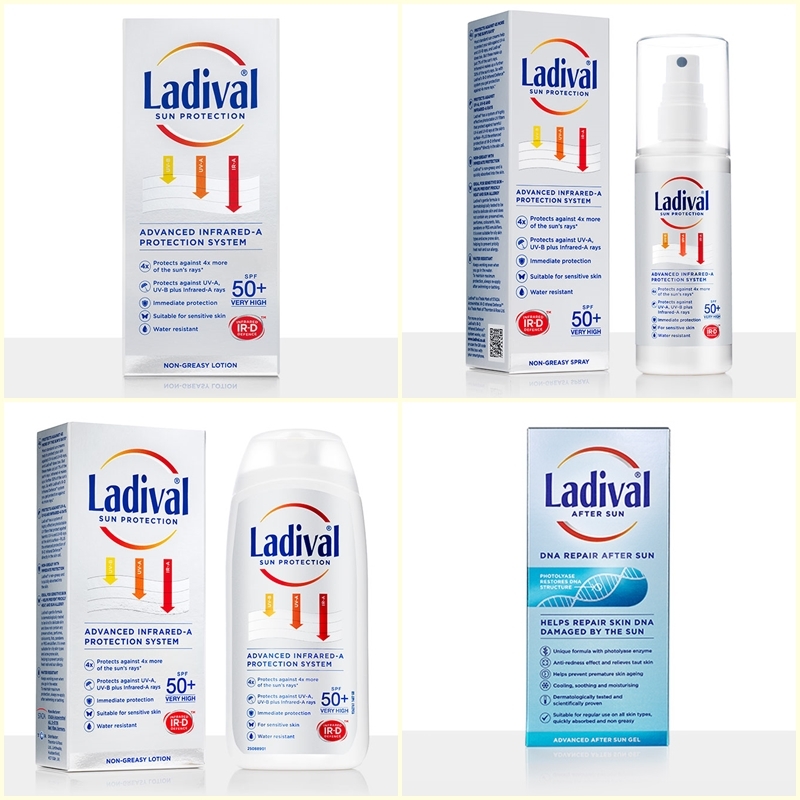 Ladival products are free from perfume, colourants, preservatives and emulsifiers which make them suitable for the sensitive and eczema skin sufferers as well as those who suffer from sun allergies and prickly heat. Ladival also has a unique, non-greasy formula that offers immediate protection and is water resistant, great for at the beach and swimming. Got burnt by the sun??? Ladival DNA Repair After Sun is the only product in the UK to contain photolyase enzyme, a special ingredient which supports the natural regeneration process for sundamaged skin through a photoactivation mechanism. When skin is exposed to the sun it creates a reaction within our cells and as a result, the rate at which we produce melanin increases, hence a tan. The purpose of this is to help protect against the damage from UV-B rays. If we have too much sun, the protective mechanism is overwhelmed and the skin releases chemicals to protect the area from further damage and this is known to us as sunburn. The skin becomes hot, red and painful and at a cellular level the DNA is damaged and the DNA strands become bonded together. If the body cannot repair the damage, this is the basis of skin damage and the effects are skin laxity, wrinkles and pigmentary changes. How does Ladival DNA Repair After Sun help? Photolyase enzyme is found naturally in the blue-green algae Anacystis nidulans. 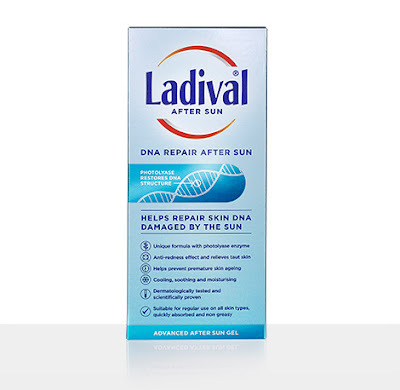 Ladival DNA Repair After Sun harnesses the natural power of this enzyme and uses it to help repair DNA damage, restoring structure and reducing the development of sun damaged cells. This supports the skin’s natural regeneration process. Restoration of damaged DNA results in better protection for skin against the long-term effects of UV-B. • Use on an ongoing daily basis like you would a moisturiser to ensure that your skin remains nurtured • To ensure that the photolyase enzymes can take optimum effect, wait 30 minutes before applying any oily skin care products to treated skin area. I was sent the lotion and spray, both of which are non-greasy and suitable for the sensitive skin. The lotion which is an SPF 15 is of medium consistency and really easy to apply from the squeezy bottle. The lotion which is non-scented spreads easily over any area your applying it to and is absorbed really quickly, leaving skin soft and moisturised. The spray which is a SPF 30 is so easy to apply and handy when your on the go and need a quick application of sun protection. Its the same colour and consistency as the lotion and is easily absorbed when applied to the skin. Both formulas are non-greasy and i felt no residue or product build up on my skin when using these. Some sun protection lotions or sprays can make you feel uncomfortable due to them being over-greasy and make your skin feel sticky. • Re-apply regularly, especially after going in the water. Both these products were great on application and felt of high quality, skin loving care, during the day like i had used a luxury moisturiser! If your wanting to see what products will suit you or your whole family, head on over to check out the whole Ladival Range. Find out more about Infrared-A Rays, knowledge is power! Enjoy those sunny days! X Neil.